I bought this book a little while ago in the sale section at House of James. I got it with a study series as well in the hopes of potentially using it or offering it to other groups in the future to go through. Ive started reading it this week and Ive enjoyed it so far. I appreciate the fact that the author states emphatically at the beginning that one could write entire books on each chapter point that she makes. That said the points she makes are concise, backed up with straight forward biblical reasoning along with scripture but her practical examples are very few and she does not explore further into trickier issues. Since she has acknowledged this the reader needs to make sure they do not 'throw the baby out with the bathwater' as the saying goes. There are gaps in this book yes, but as a whole we need to see the good in her broad umbrella picture of lies we as women face THEN explore particular issues with a deeper analysis with other writers and professionals. 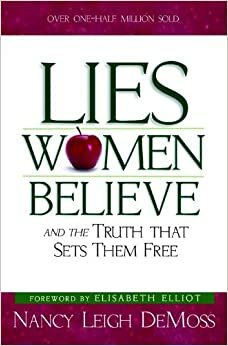 I think if a woman is reading this book and she notes there is a particular 'lie' or two that she struggles with then there are other books she can search out regarding that topic. De Moss provides a section at the back of her book with a list of added books to read. That said, the list is not exhaustive and is confined only to a short list and minimal resources at best within the US (where the author is based). As a piece of constructive criticism it would have been helpful for this author to do more research into some points that I felt she was well intentioned but obviously ignorant in, in particular abusive relationships. I note that this author is well known as being a woman of God happy in her state of singleness (until recently that is), and is not a Mom herself. While I accept that she is allowed to have opinions on biblical wifedom (and attached to that, ideas on submission) and motherhood, I personally think she has a limited view from her inexperience in these matters. I have opinions on how to raise children, but I know full well that my friends with children would be skeptical and at the very least hesitant on listening to me if I started telling them how to raise their children. Even if all my theological ideas on child rearing are Christ driven and correct! I just don't have the authority needed, and in the case of DeMoss I feel in some areas she also does not have experience and therefore cannot be a reliable authority on certain matters no matter how theologically correct she is. I may only be 27 years old but I feel personally I have a mountain of wealth in my own experience on domestic abuse while she as a single woman in midlife that she does not have. That means if the two of us were lined up and given a young woman to counsel who was in a physically or emotionally abusive relationship, I would expect that having more experience and practical know how in this topic would make me a far better mentor for such a person. Thats not pride its just a fact. That said she does cover a lot of areas well enough. I know its a lot. But read through them all. Do any bring on fast response in you? Outrage? Guilt? Confusion? Quiet agreement? I'll bet at least two of them got your attention. I don't know which ones but I know when I first went over them my reaction to this author was - "Can you believe the nerve of this lady??" I know, I know. Hear me out. Read the book first THEN get uppity. I suspect the titles are written in a way to get your (maybe negative) attention. Hear this lady out! Sure, be offended, but at the very least be open to reading what you think she might say. You'll be surprised. You may end up reading the book and still not agreeing with her on a few or more or maybe all things. Thats ok. Just read it and consider the thought that she might bring you a convincing argument about that 'little' lie you nestle and look after. We often get extremely angry at the person who rips our comfort sins out of our arms and I have no doubt you'll feel the same way about this lady. You may read this book and have to put it down then take it up again a few hours later to digest what she writes. A few years I had some very strong feelings over certain secondary issues and I would have been outraged then that today I have softened my views or changed them altogether. It was regarding pacifism. I won't get into it but my views changed somewhat because I allowed others to freely share their opinions with scripture with me without immediate judgement.